Map of Pangaea with Laurasia and Gondwana. Laurasia (/lɔːˈreɪʒə, -ʃiə/) was the more northern of two supercontinents (the other being Gondwana) that formed part of the Pangaea supercontinent around 335 to 175 million years ago (Mya). It separated from Gondwana 215 to 175 Mya (beginning in the late Triassic period) during the breakup of Pangaea, drifting farther north after the split. Although Laurasia is known as a Mesozoic phenomenon, today it is believed that the same continents that formed the later Laurasia also existed as a coherent supercontinent after the breakup of Rodinia around 750 million years ago. To avoid confusion with the Mesozoic continent, this is referred to as Proto-Laurasia. It is believed that Laurasia did not break up again before it recombined with the southern continents to form the late Precambrian supercontinent of Pannotia, which remained until the early Cambrian. Laurasia was assembled, then broken up, due to the actions of plate tectonics, continental drift, and seafloor spreading. During the Cambrian, Laurasia was largely located in equatorial latitudes and began to break up, with North China and Siberia drifting into latitudes further north than those occupied by continents during the previous 500 million years. By the Devonian, North China was located near the Arctic Circle and it remained the northernmost land in the world during the Carboniferous Ice Age between 300 and 280 million years ago. No evidence, though, exists for any large-scale Carboniferous glaciation of the northern continents. This cold period saw the rejoining of Laurentia and Baltica with the formation of the Appalachian Mountains and vast coal deposits, found in regions including West Virginia, Britain, and Germany. Around 200 million years ago, laurasia started to break up. Between eastern North America and northwest Africa, a new ocean formed - the Atlantic Ocean, though Greenland (attached to North America) and Europe were still joined together. The separation of Europe and Greenland occurred around 55 million years ago (at the end of the Paleocene). 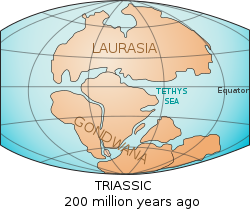 Laurasia finally divided into the continents after which it is named: Laurentia (now North America) and Eurasia (excluding the Indian subcontinent).